Last Sunday we had some family coming over and wanted to make a mixed grill to feed everyone. 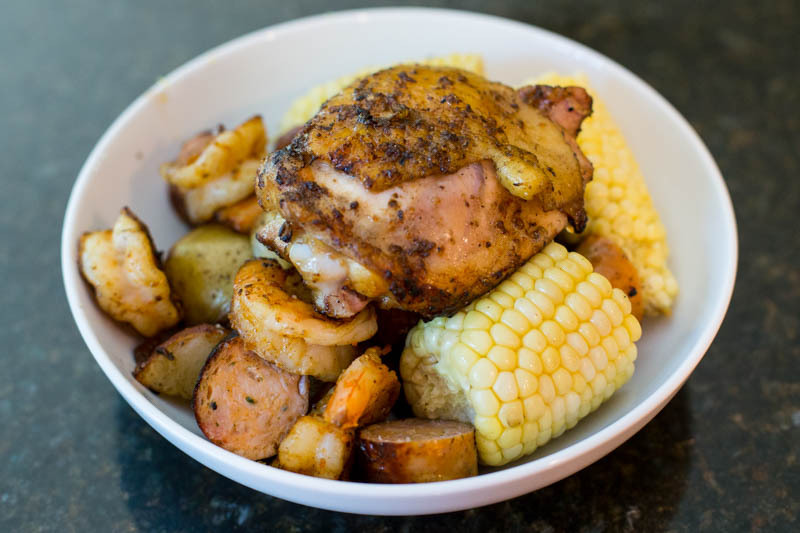 For this cook I went with bone-in chicken thighs, shrimp, sausage, potatoes, and corn. The trick to a cook like this is timing and grilling space. No worries as I was able to navigate both and come out with a great meal for all to enjoy. Now sit back, grab your favorite IPA, and enjoy this recipe for Big Green Egg Mixed Grill. To prep for this cook I preheated the Big Green Egg to 400° measured at the dome. I had two types of chicken sausage (yes… Mrs. Buddha got us chicken sausage) and shrimp that I skewered then rubbed with Dizzy Pig Tsunami Spin. For the bone-in, skin-on chicken thighs I rubbed them with Dizzy Pig Tsunami Spin then cooked them face down for 4 minutes to render the fat and get the skin crispy. After the chicken skin was nice and crispy I placed them on the top tier of my 2-tier rack with the shrimp. On the bottom tier I cooked the sausage, potatoes, and corn. For the potatoes I quartered red skin potatoes, tossed them in fresh garlic and olive oil, and placed them in a small Cast Iron pan. They came out nice and crispy. The entire cook took me about 30 minutes and produced a bountiful display of meat and vegetables! The corn was cooked whole by smearing butter and fresh basil on the cob then wrapping in foil. After the cobs came off the grill I cut them in half and mixed them with the potatoes. I sliced the sausage and tossed that with the potatoes, shrimp, and corn. Topped it off with a chicken thigh and served! This recipe for Big Green Egg Mixed Grill is the perfect dish to serve at your next family gathering. I am drooling now! I really do wish I could afford a green egg…. There is a guy named Ian that does a sport radio show in Tampa and swears by his Green Egg when he does his Ribs and everything else he cooks. One day I will have one. If you have a Green Egg you don’t need anything else! Thanks Lew! Ian is correct… once you get an Egg you don’t need anything else!